but, actually, that statement isn't really true. 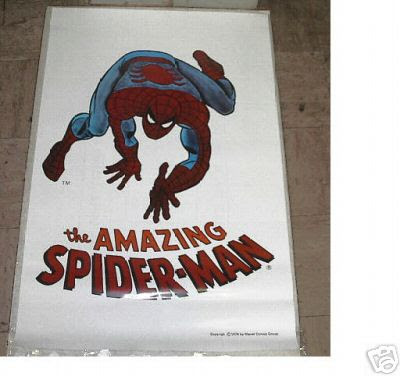 and the other missing artifact from my four-color adolescence just happens to be a poster as well, this one a normal sized (24" x 36") spider-man, this one drawn by, i believe, the great jazzy john romita. i got it around the same time, i remember, but here's the twist--this one was a blacklight poster!!! and not just a flat blacklight poster, but the fuzzy, black velvet kind of blacklight poster!!! man, i loved that thing! i can't even find a picture of this on google, which seems amazing to me! wish i could show you. it was great! though i can't show you that one, here's a pic of another john romita spider-man that was posterized and all the rage back around 1974! man, that guy can draw spidey! so, maybe i'm just way too nostalgic or trying desperately to cling to a wonderful childhood, but what were the things that you had--posters, books, toys, 'tever--that you'd love to have again...? In the Spider-Man department, I still have my "The Amazing Spider-Man: A Rockomic" LP record with the John Romita poster - not the one in your picture, though it is torn have way through along the fold line. I might even still be able to lay my hands on a turn table on which to play it. As for my own missing childhood memory, it was a plastic model of the ship the "Voyager" from the saturday morning cartoon the "Fantastic Voyage"
The tail broke on the one I had and then, the inevitable, lets blow it up with a firecracker fate of so many damaged models from my childhood. An original one in the box goes for big, stupid money on ebay, but Monsters In Motion have a recreation you can get for $125.00. Might just have to pick that up one of these days. I don't have too much that I'm missing from childhood. My mom was kind enough to let me leave all my toys in my closet back home. And more importantly these days, hidden from my cousins. But, my dad told me that one of them is on to what's in my closet. And he's very curious. In college I did have a Rick Leonardi Spidey poster that didn't survive my many relocations. I'd love to find that one again. But, my favorite kid day toy was a die-cast millenium falcon that i got for my 6 or 7th birthday. I have it now in my living room. And it may be one of the best Falcon models I've ever seen. Scott, if you're talking about the micro machines millenium falcon, I couldn't agree with you more. They did a great job with the X-Wing fighter as well. Actually, the one I have pre-dates Micro Machines. It's vintage 1977. Well, actually, I think I got it in 79. But, I remember those Micro Machine ones. They were great too. 5.Mattel's Masters of the Universe Castle Greyskull. As 1 of the non-4 people who read this blog I have to chime in. I still have a lot of my childhood stuff..i.e. toys, still hanging around. I've given away a lot, sold some, others have just gone by the way-side. I still have my 8" Mego Spidey...love that guy. The six million dollar man action figure. My Dad, bless his soul, never called my toys "dolls" he always referred to them as my "mens" or as my "guys". One of the things I wish I'd never put in a yard sale was my Shogun Warriors Godzilla toy. Man that thing was awesome and my son would get a huge kick out of it now..seeing as how he's a chip off the old block. I've kept some of my vintage Star Wars figures.. a lot of the others went bye bye. I've got a couple Johnny West guys sitting on my desk.and a closet full of comics toys and what not behind me just waiting for the new house and a room to be displayed in. I'll send pictures someday.